Ok yea, so it’s almost February… I know I’m a little late with this post. Either way I wanted to get at least one post in for the month of January. At the beginning of last year I wanted to get back into doing more personal art work, be more active on social media and get more visitors/views on this website. For the most part I was successful on all of those goals. I didn’t get to do as much networking in person this past year. Being busy at work prevented that. Spent most of my year working on a really awesome project, that is continuing into this year. Wish I could share some of the that work… maybe someday. One major milestone that I hit this past year back in January was hitting the 10 year mark at Boeing.It has been a pretty amazing ride thus far. I’ve held a few different positions. All of which have allowed me to be involved in 3d visualization. When I first graduated college I thought I would work in film, TV, commercials, video games maybe even architectural visualization. The aerospace industry wasn’t even on my radar. But when you are right out of college and a major company says they’d like to hire you to do 3d modeling, animation, graphics and video editing, you don’t say no. I never would have thought, that 10 years down the road I would still be doing visualization for Boeing. I have learned more about engineering and manufacturing over the last 10 years, than I ever thought I would as an animation major at LMU. What is really neat to think about is, that all of the cool sci-fi stuff that people dream about being a part of in the entertainment industry, I get to be a part of the real deal. When I see other artist looking at reference for their project ideas, a lot of it is based upon current aerospace technology. So here is another year ahead of me with many opportunities to learn and grow. This year I would like to continue work on more personal projects, learn ZBrush and bring more people to this site. Excluding this past month, one of my goals is to post here once a week. I was given a “One Sketch a Day” sketchbook as a gift, so I’ll be working on that too. Looking forward to what this next year has in store. 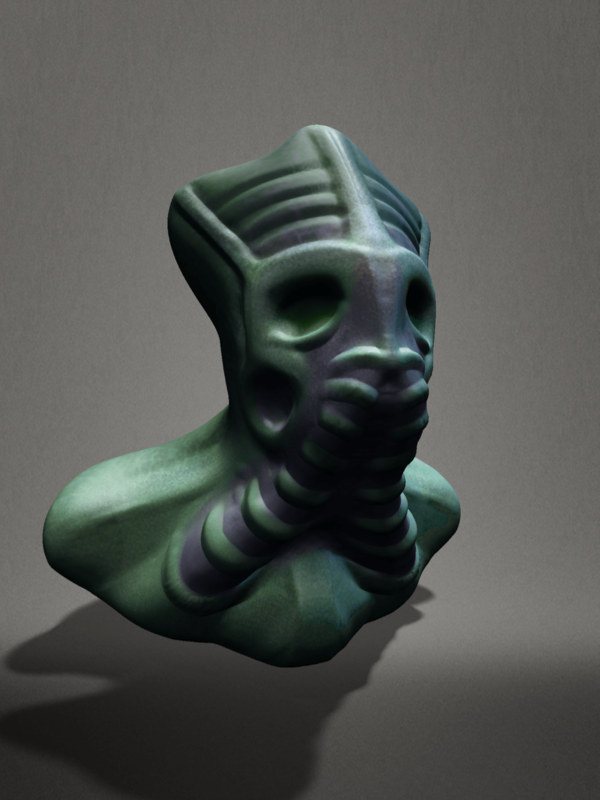 Fun program, easy to use and a lot of cool features for a mobile sculpting app. This entry was posted in 3d Art, Art, Digital Art, Life Events, Sculpture and tagged 123D Sculpt, Alien Head, Digital Art, iPad by Jammin. Bookmark the permalink.